Hurricane Sandy merely brushed the state of Maine, and while most of us lost power for a time, and trees were downed, and flooding did occur, we are far more fortunate than the millions who lost so much more - life, property, and the irreplaceable treasures of accumulated photographs, books, documents and the like. The single blessing of such an event, at least for me, was the forced but acceptable return to the days before computers, the Internet, ebooks, iPhones and their kindred, turned us into consumers of bytes, lost without the electronic world. And while I was pleased when the power returned after a night and part of a day off the grid, I thoroughly enjoyed the setup below: a wood stove fire, a good book, and candles to read by. It's so good to read that you are OK. 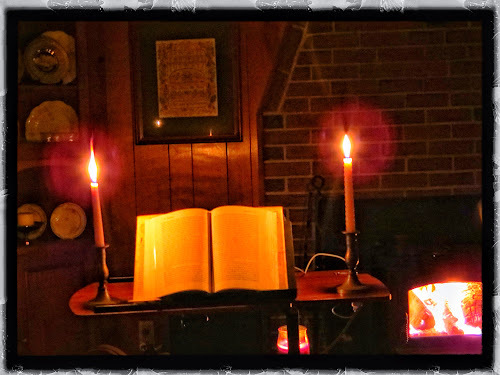 I have enjoyed the fireplace-food/candles/and books scene several times in my WI county. But in deep winter cold it's not fun at all. I bet you have a good supply of candles. Our candle stock could light the neighborhood - but too many of them have generators, the sound of which is like living in the midst of the world's busiest airports! Last night, the sound of the generators out-blasted the roar of the wind. Glad I am that you posted up. I am worried about all of our blogging friends on the East coast and hadn't heard much about Maine. Nothing like candlelight and a fire to add a little ambience. Thanks for posting and letting know you are doing well. So far, it seems that Maine was extremely fortunate in avoiding massive damage. Flooding - our basement was ankle-deep - caused the most problems. Most of us have power, and are back in the swing of things. thank you for posting that you are okay. On the news we keep seeing the weather map where Sandy was coming directly into your path. As I said in the post, I think that the greatest losses are the photos and documents. For instances, we have drawings, little notes, various birthday and holiday cards from our three sons, beginning from the time they could put crayon to paper. We have pictures of so many special moments of our lives as a family. To lose just one of them forever would rip something vital away. To ponder how much so many families lost to the storm is horrible. I, too, am glad to know how you fared. My Dad and my sister in Michigan both got tired of the ice storms knocking out the power for days and have generators. Oh well. That's some book! Looks like Mickey's book of spells from Fantasia, only bigger, with more spells. On the off-chance that it is, could you do me a favour and cast a spell that gives me three wishes... oh ya, and the wisdom to choose wisely. Tom, on the loss of photos, we had massive flooding in 1987 that left three feet of water in our basement. By some cruel twist of fate, we were painting our bedroom, and all our photos were temporarily in boxes in the basement. I remember going throught he soggy boxes and folders of Kodachrome prints desperately trying to salvage what I could, as the pictures were dying as I worked. I managed to salvage perhaps 5% of the total. It was heartbreaking indeed. Take care. The book isn't nearly as fanciful as a book of spells - it's the new biography of Lincoln's Secretary of State, W. H. Seward. Come to think about it, the life of any politician is mighty fanciful! I am sad to hear of your loss of those photos. It's sobering to contemplate just how fragile our treasures are.